AFC Fylde suffered a second 1-0 defeat in four days away to rock-bottom Guiseley. 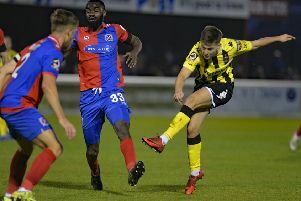 Rowan Liburd’s 86th-minute tap-in gave the home side a valuable three points in their desperate attempt for survival but dealt a blow to the Coasters’ promotion hopes as Dave Challinor’s side slipped down to ninth in the National League table. Challinor made three changes to the side that suffered a rare home defeat at the weekend, with James Hardy - making his first start since early October - Jonny Smith and Sam Stubbs replacing Andy Bond, Henry Jones and Jack Muldoon. Guiseley forward Will Hatfield, still not forgiven by Fylde supporters for his four goals in a 4-1 FA Cup defeat against Accrington Stanley in 2012, was first to test Jay Lynch when he fired a stinging drive straight at the Coasters stopper. The league's top scorer Danny Rowe forged a shooting but his left-footed strike from 20 yards was easily claimed by Luke Coddington. Smith’s cross into the box shortly before the mid-point of the half looked harmless enough. However, Coddington made a hash of his catch, but Ash Palmer cleared before Rowe could pounce. Keen to impress on his return, Hardy twisted and turned in the Guiseley area but his finish left much to be desired as it cleared the stand housing the sodden travelling Fylde support. Striker Dayle Southwell, signed from Wycombe Wanderers towards the end of last year, was urged to shoot as the Lions hunted for scraps and was a whisker away from finding the bottom corner with a low drive. While the visitors were controlling the play, clear cut chances were at a premium. The Coasters let out a huge sigh of relief when a sensational goal-line clearance from Simon Grand prevented Guiseley caretaker manager Sean St Ledger from finding the far corner with a curling effort from 10 yards. The visitors’ pressure was starting to build after a forgettable first half as Smith flashed one through a crowd of players and narrowly wide of the far post. And it was the on-loan winger who really should have broken the deadlock. Smith latched on to an incisive long ball from Stubbs, but rather than poke a shot past the goalkeeper he took a touch, allowing Coddington to make a crucial block. Southwell launched a powerful effort in retaliation that arrowed a foot high and wide of the woodwork. Rowe forced a decent save from Coddington with a deflected strike that was drifting towards thew bottom corner. Tunnicliffe too was agonisingly close with a looping header that dropped a foot the wrong side of the post as the clock ticked down. However the Coasters were made to pay for missed chances when Guiseley struck the killer blow. John Rooney’s dart down the right and pinpoint cross found Liburd closing in on goal and the frontman, anonymous for much of the evening, couldn't miss. Guiseley: Coddington, Palmer, Hatfield (Wesolowski 77), Rooney, Southwell, McFadzean (Roberts 73), St Ledger, Holden, Liburd, Harvey (Purver 77), Crookes. Fylde: Burke, Stubbs, Tunnicliffe, Grand, Francis-Angol, Montrose (Jones 88), Finley, Smith (Blinkhorn 75), Hardy (Muldoon 64), Rowe.